Is this headstone a Woodman of the World marker? What is a Woodman of the World Headstone? Almost every cemetery in the U.S. will have at least one Woodman headstone. The Woodmen of the World was founded as a fraternal organization that provided financial security to its members in times of need. The organization sold insurance, especially for people in high-risk occupations, and many of the policies included riders for a tombstone. In Colorado, the very common high-risk occupation was mining. The organization was committed to the motto "no Woodmen shall rest in an unmarked grave." From about 1890 until the 1920s, the insurance organization commissioned markers for its members. These markers were provided free of charge, and varied greatly in size and shape. Most commonly, they resembled a tree stump or a stack of cut wood. Some are elaborate hand-carved trees, with fine detailing. Others were simple stone markers, with the Woodman emblem. The craftsmen received the standardized designs from the organization, but, often modified the designs. The result was a a treasury of beautifully carved tombstones. Not all the markers carved as trees are Woodman of the World headstones. 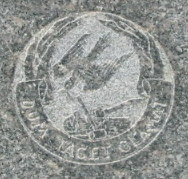 Woodmen of the World markers have the society's emblem with the motto "Dum Tacet Clamat," which means "Though silent, s/he speaks." The easiest Woodman markers to spot are the ones which proclaim "Here rests a Woodman of the World." When the cost of providing the markers became too costly, the Society stopped providing the markers. Instead, members and lodges arranged for markers and monuments for those who died. Even today, members can purchase a bronze marker, with the society's emblem, to be fitted onto their headstones.